Share your favorite Sunday Supper recipes on social media! 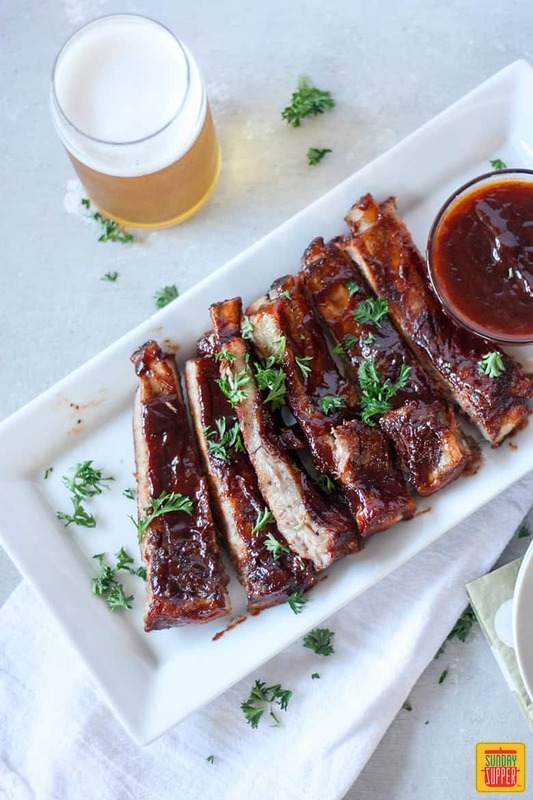 You NEED to try these Slow Cooker Pork Ribs with Bourbon BBQ Sauce! Possibly the EASIEST way to make BBQ ribs EVER! 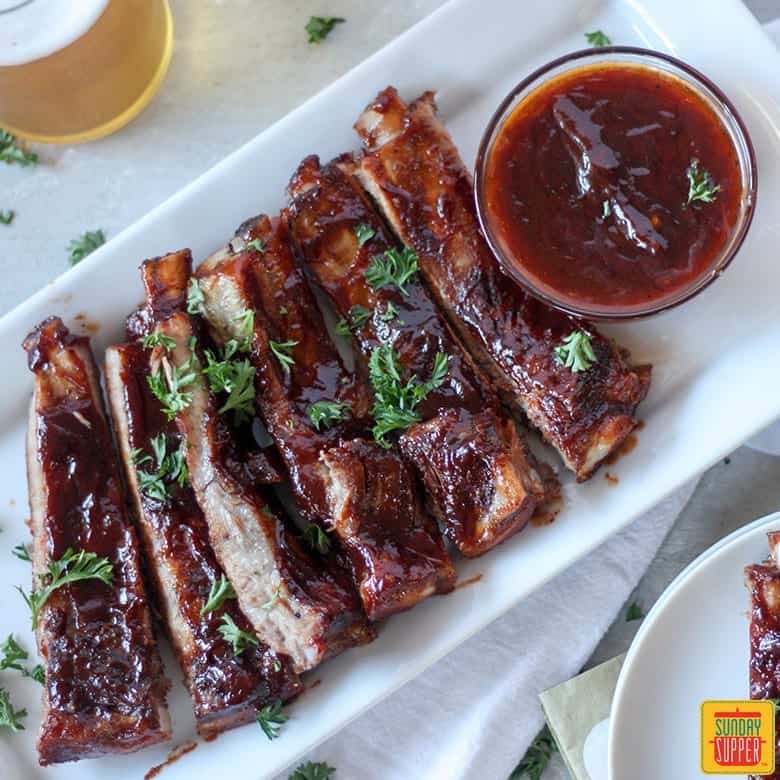 Score big when you feed your hungry game day crowd these FALL OFF THE BONE tender, sticky ribs! The perfect Easy Football Food Idea for Game day! Ok, I’ll be first to admit, I do not know a lot about football. NFL to put it politely. Don’t hate on me. I come from a country where football means a completely different thing (Australian rules, more contact, less protective gear!). When Americans talk to me about football, I just stare blankly at them, not really sure what to say back. I know what a touch down is, but that’s about it. Invite me to a football game day party though, and I am there! Mainly because of the food. Game day party food is the best! If there is one football lingo I do understand, it is ‘game day party’ and you know I’ll be there with bells on. Cue, Slow Cooker Pork Ribs with Bourbon BBQ Sauce. These Slow Cooker Pork Ribs are the perfect easy football food idea. They are super easy to make, require minimal effort, have maximum flavor, and are the perfect little snack to keep you sustained through the day. 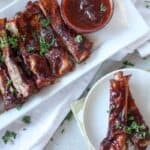 Slow cooker recipes are always my favorite when I don’t necessarily want to spend hours cooking, and these ribs are no exception. You simply place ingredients in the slow cooker, set for 4 or 8 hours depending on how time rich or poor you are. Take them out and broil for 8-10 minutes and voila, perfect, fall off the bone, beautiful Slow Cooker Pork Ribs with Bourbon BBQ Sauce! No slow cooker? See the recipe notes for oven baked ribs instead. Slow cooker will end up in slightly softer ribs, but both methods work great. Oven baked take around 3 hours, compared to about 4.5 hours for slow cooker recipe. Use your favorite barbecue sauce! I love sweet baby rays hickory and brown sugar. Game day entertaining doesn’t have to be extravagant, nor does it have to be stressful! All you need is a few great go to party recipes, a little bit of your time, and a gang of hungry guests to feed! Sign up for our newsletter to get FREE Sunday Supper recipes delivered right to your inbox! The perfect finger food for a game day party! 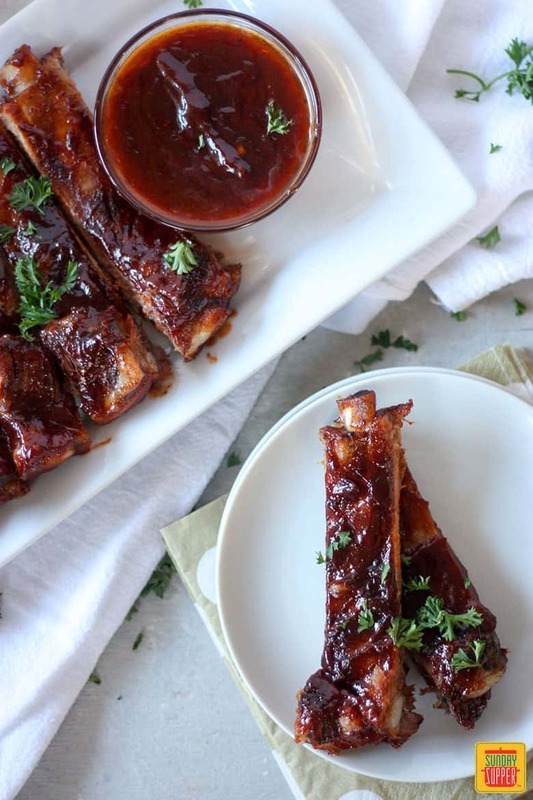 These Slow Cooker Pork Ribs with Bourbon BBQ Sauce are easy to make, and oh so delicious! 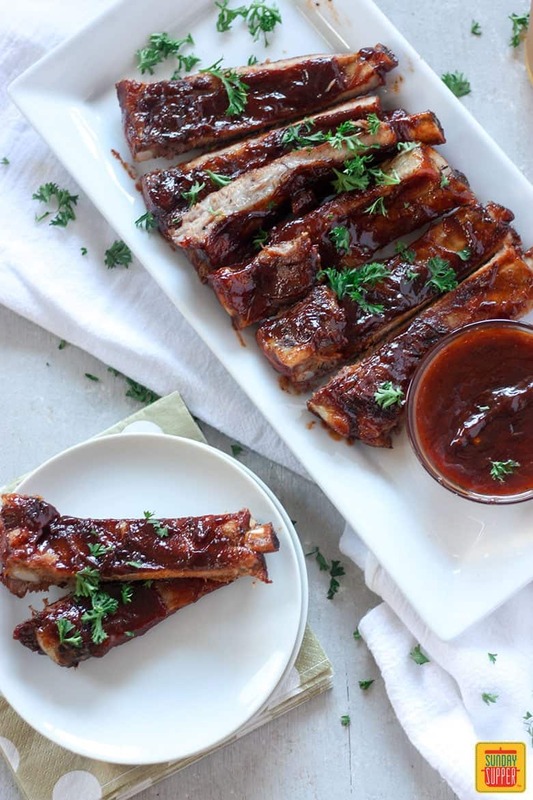 Make your game day special with some delicious sticky ribs. Place paprika, cinnamon, garlic powder, oregon and salt and pepper in a small bowl and mix. Using a knife, carefully remove the membrane from the rib. Spoon the rib rub onto the pork ribs, and use hands to coat ribs on both sides. Place ribs in slow cooker. Combine barbecue sauce, bourbon and brown sugar. Add 3/4 of the barbecue sauce mixture to slow cooker. Cook on high 4 hours, or low 8 hours. Once cooked, set oven to broil at 300F. Remove ribs and place on tin foil lined baking tray. Spoon over 4 tablespoons of the rib sauce from slow cooker. Baste 1/2 of the remaining barbecue sauce. Set in oven for 8 to 10 minutes, or until sauce starts to caramelize. Place remaining barbecue sauce and leftover juices into a small bowl for dipping. Cut ribs into pieces and serve. Garnish with a little parsley if desired. Rub pork ribs with the rib rub. Wrap ribs in tin foil. Place in oven and cook 2 to 2.5 hours. Remove from oven, discard juices. Baste with the rib sauce on both sides. Place back in oven for 30 minutes, basting every 5 minutes until sauce is sticky. Use a spoon to carefully scrape remaining barbecue sauce into a serving dish for dipping. These ribs look fantastic! And that sauce! Cannot wait to try this BBQ sauce! Anything with bourbon is delicious in my book! This sounds absolutely delicious, and I love that it’s made easier by cooking in the slow cooker too! Ribs are perfect football food! I love this slow-cooker, oven finish method too- very easy! Sunday Supper starts off as one day a week and soon becomes a way of life. We strive to create a better future for families, by partnering with brands and services that help families feel good, eat better and interact with each other. We want our mission to reach the homes of all families and inspire people across the world to spend time around the family table. Copyright ©2019 SundaySupper LLC. All Rights Reserved. Family Foodie and Sunday Supper Movement® is a registered trademark of Sunday Supper, LLC.